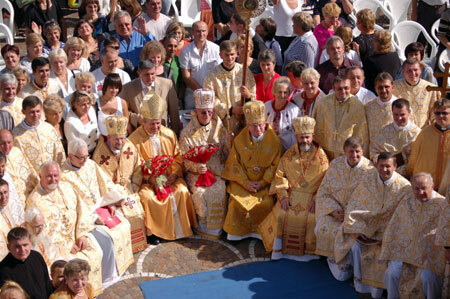 Buchach diocese of Ukrainian Greek Catholic Church - National pilgrimage of Ukrainians to Saint Sofia in Rome has finished. National pilgrimage of Ukrainians to Saint Sofia in Rome has finished. The third day of the International Pilgrimage to the Cathedral of Saint Sofia was the culmination as the largest number of pilgrims gathered. It is important to underline the fact that along with the Ukrainians which live in Italy, Ukrainians from other countries of Europe and America also took part in the pilgrimage. During the Liturgy Bishop Hlib (Lonchyna) marked the importance of the relation of man to God. “Often we speak to God during our most dire moments, but it necessary to be with him every day,” stressed the bishop. That day the Liturgy held a special meaning because exactly forty years ago the Saint Sofia Cathedral was solemnly blessed by the Holy Father Paul VI and the relics of the Holy Pope of Rome Clement were brought. As was noticed by Bishop Hlib, Saint Sofia in Rome is an evident example of the unity of our Church with the successors of the holy Apostle Peter. “From the beginning when Volodymyr’s baptized Rus’, our land supported contacts with Rome on different levels,” underlined the bishop. The celebrations at Saint Sofia were completed with a concert of spiritual songs performed by the choir of Ternopil’s seminary. On Wednesday, October 14, on the feast of Saint Veil of the Mother of God, 500 pilgrims will have a solemn audience with the Pope of Rome Benedict XVI. Let us recall that from October 9-11 of this year the International Pilgrimage of Ukrainians took place to the Saint Sofia Cathedral in Rome, marking the 40th anniversary of the blessing of cathedral, the 25th anniversary of the death of its builder His Beatitude Patriarch Joseph, the 65th anniversary of death of his prominent predecessor the Servant of God Metropolitan Andrey Sheptytskyj, and the 50th anniversary of the blessing of the rooms of the small seminary, which the Apostolic capital built for Ukrainians, and from which graduated over five hundred students, almost one hundred of them priests, which together became the spiritual and public preachers of the Ukrainian settlements in western Europe. Today many students from Ukraine study there.